On Tuesday I showed you some books I’m on the fence about reading (so you could push me off the fence). On Thursday I wrapped up January. On Tuesday I go reading and walking. On Thursday I show you the best books I’ve read in the past 5 years. So . . . last week was horrible. I read over 500 pages and finished 0 books. I decided to give up on Arcadia by Iain Pears and The Shadow of the Wind by Carlos Ruiz Zafón because life is too short. Both books are really slow, really long, and I didn’t care about the characters. I ran out of patience with them. Right now, I’m reading Three Things About Elsie by Joanna Cannon. I’ll actually be able to finish this one! Marie @ Drizzle & Hurricane books is talking about tropes she loves. Stephanie Jane @ Stephanie Jane is talking about her experience with #Veganuary. Sofia @ Bookish Wanderess is recommending books with autistic characters. Erica Robyn @ Erica Robyn Reads is sharing some cringe-worthy review requests. I saw a documentary called Three Identical Strangers. If you like conspiracies and stranger-than-fiction stories, you should watch it. My dog got groomed! She’s so fluffy and doesn’t smell awful. It’s almost Valentine’s Day. That means candy! No, my sister’s baby isn’t here yet. The due date is today, but there’s no sign of any baby. I guess the baby likes living inside my sister. Come out, Brooke, you can't stay unborn forever. I’m going to finish it! I have 100 pages left and really like it so far. It's better to give up on a book that isn't working for you. I say, Good job! On to better things! There is no time in my life for a book that isn't catching my attention. I used to read books even if I didn't like them. I don't do that anymore. Life is too short to waste on things I don't like. Hope this is a better reading week for you. Thanks! I’m trying to get better at giving up on books. I hate investing in a lot of pages and then being disappointed! Me, too! I thought I wanted to read a long book, but I guess not. Bwahahaha so your dog is fluffy and does not smell badly right? Mine is so in need of a trim she looks like a big puffy ball! Thanks for the links because my curiosity is picked now about the cringe worthy review requests! Headed there! Happy Sunday AJ!!! My dog likes to roll in things, so she gets gross quickly! I wish grooming wasn’t so expensive. She needs it more often. Those last few weeks before baby comes are the longest possible. I was induced both times and even having the date scheduled I swear the days just crawled! Too bad about not finishing any books but good for you for calling it quits on books you weren't enjoying. Life is definitely too short. Have a great week! If the baby doesn’t come soon, my sister might need to be induced. The baby doesn’t want to come out! Whoa, 500 pages and you DNFed both! Oh, my, I hope this week is better reading-wise! I already know my husband got me candy for Valentine's Day (the box fell out of the closet and almost gave me a concussion), but I'm still eating candy from Christmas. Haha, that’s an unpleasant way to discover your Valentine’s present! I started reading Three Things About Elsie, but set it aside. I hope to rejoin the characters when I am in a better mood. Enjoy your week...and baby Brooke! Thanks! Three Things About Elsie is slow, but I like it so far. Oh I have heard great things about Three Identical Strangers. I need to get to it. Hope the baby comes soon!! Have a great week! Thanks! I’ve been recommending Three Identical Strangers to everybody. It’s kind of mind-blowing. I hope your sister is doing well with her pregnancy! She’s uncomfortable, so hopefully the baby shows up soon. That documentary sounds fascinating, I'm definitely adding it to my list. Congrats on finishing the Cybils, I know it was super time-consuming! It was time-consuming, but totally worth it. I really like judging books. I love candy, too. That’s the only thing I like about Valentine’s Day. Ugh, two DNF's in one week. You're so due for a good one. 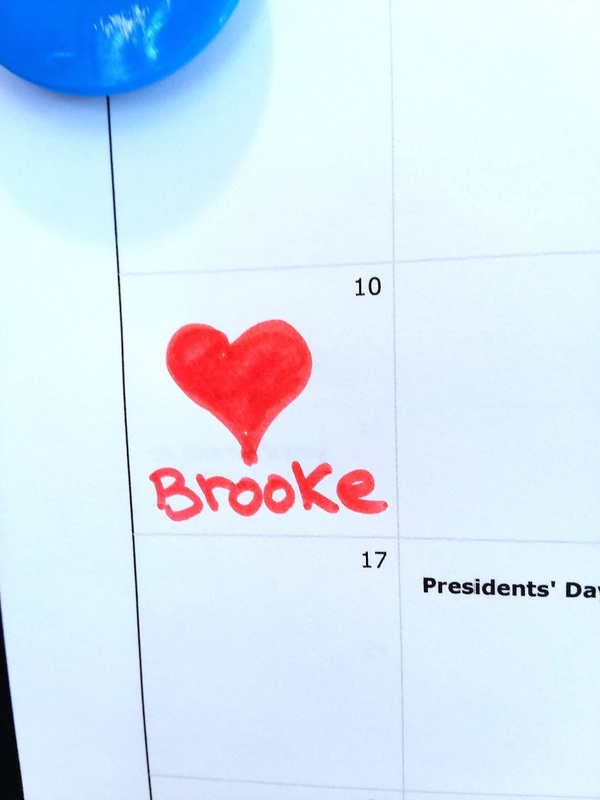 Speaking of due... will Brooke get here already? LOL Two enthusiastic thumbs up for V-Day candy. Luckily, Three Things About Elsie is pretty good. I’m hoping to finish it today. Ooh best of the last 5 years? That sounds like a fun post. 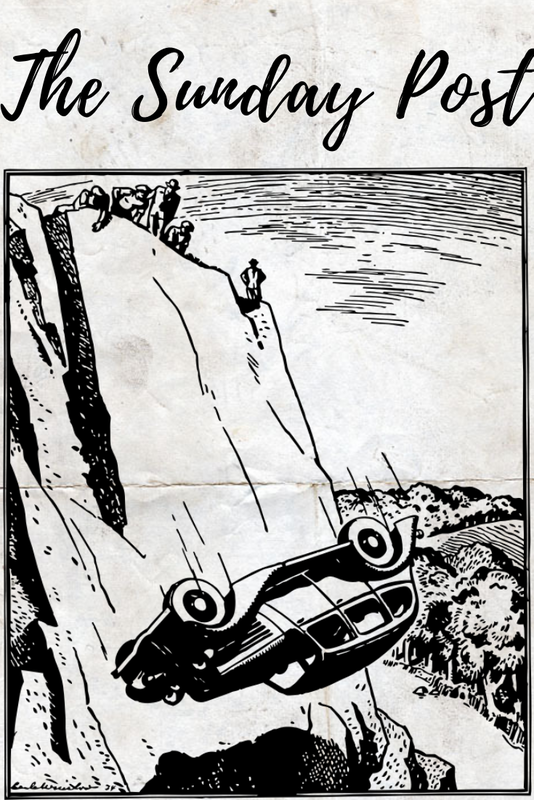 And oh my gosh why are those people pushing that car off a cliff? That cracked me up a little actually. Candy! Yum. And imminent baby! She must know how cold it is out here and she's like no way. 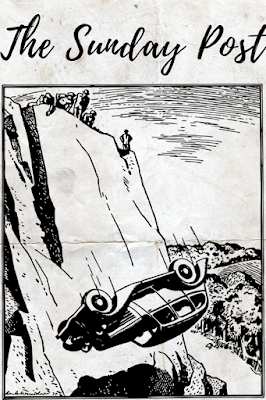 Haha, I have no idea why they’re shoving a car off a cliff, but I bet it’s a good story. Wow, really? I still haven't read The Shadow of the Wind. I've been expecting it to be amazing. I have an English and a Spanish copy. Now I'm nervous! LOL. It was too slow for me. I lost patience. I hope you like it more than I did. My heart goes out to your sister. Those last few weeks are the worst, and she's past her due date. Ugh! I hope the baby comes soon. I thought the day AFTER valentine's meant candy (at 75% off). I am proud of you for DNFing, though you really tried to stick it out with that many pages read. Haha, yeah, I’ll probably get my candy after Valentine’s Day. I guess Valentine’s Day is candy-anticipation day. I remember when I'd take my Chow Chow to get groomed and bathed. She was so soft and smelled so good. She looked like a sweet blonde lion. LOL And that's a lot of pages read without finishing the books. With so many books to read, I see why you set those aside. Chows have a lot of hair! I bet she was REALLY fluffy. Sorry you read so much of those books and then decided to DNF. That's never fun, but sometimes you just have to do it. So good for you! I’d rather DNF than slog through a book I don’t like and write a bad review. Life is too short for that. I hope the baby comes soon. Everybody is getting impatient. Have a good week. Good your current read is one you are liking. I hope you like it more than I did. I hope baby Brooke decides to bless everyone with her appearance soon. I'm sorry both books didn't work out for you. I hope your next read is a lot better. The book I’m reading right now is really good. I’ll actually be able to finish a book this week! Awww, thanks for the photo, I love you too (just kidding... I mean, I do think you're cool and all, but I know the photo wasn't for me). Sorry you ended up reading two books you hated (boo). Neither of those was on my radar, so no worries for me picking them up any time soon. At least you can start tackling your own TBR with those awards done. Haha, ever since my sister chose that name, I’ve noticed a lot of people named Brooke. There are more than I thought! Ah, I was hoping there'd be baby news today! Your poor sister... My little dude was a week late and by his due date I was desperate to issue an eviction notice! I guess they come when they come. I don’t care about love, but I REALLY like candy. Food is the best part of Valentine’s Day. Oh no.. Not a great book week; I hope this one is an improvement! It's annoying having invested in a book so largely, only to DNF - but good to read what you're actually enjoying. I hope your reads this week as ones you enjoy! I'll have to check back on Tuesday - reading & walking are two of my favourite things. My Reading and Walking post is up now. I had a lot of fun with it. Definitely give up if a book isn't working for you. I loved Shadow of the Wind, but I listened to it instead of read it. I wonder if that made the difference. It probably would have made a difference for me. I seem to have more patience with audiobooks. Hope the baby comes soon. I am ALMOST finished with The Passage. Finally. Hopefully this week will see the end of it. I am starting to feel like I raised some of the characters from youth to adulthood and then death. Haha, I hope you finish that book soon! Lol! Some babies like to hang out a little bit longer. :) My niece was a week late. This baby has shown no desire to come out. Hopefully soon! Sometimes you just have to give up on books. I've stopped feeling guilty about it at this point. XD Three Identical Strangers definitely sounds like something I'd love! I need to check that out! And hurray for fluffy puppies! I hope you like Three Identical Strangers. It’s weird to think that something so bizarre could actually happen. A Valentine’s Day baby would be cool. She’s not here yet, so it might happen. I hope you get to finish with Shadow of the Wind! It's such a fantastic read. It is a bit slow, but it's a behemoth of a book, if I remember. But I really enjoyed it. I might try it on audiobook someday. It is really long. I agree. I don’t like petting her when she’s stinky. I hope Brooke comes out strong and kicking! Congrats to you and your family :) What is your favorite candy to get on Valentine's day? Anything chocolate! I especially love chocolate and caramel. Wow, 3 weeks? We’re impatient for the baby to get here, but she doesn’t seem ready to come out. What a week! That is a lot of pages read in non-finished books. I hope baby makes an appearance soon. Come see my week here. Happy reading! I hope the baby come soon, too. This week’s reading has been much better. Sorry you jumped from Cybils wonderfulness to two books you weren't thrilled with. It always feels frustrating when you read 500 pages and still end up DNFing. Ugh! These books were a rude awakening. The Cybils books were so good! Then I got bogged down in 2 giant monster books. My sister in law was two weeks late, I cant' even fathom having to carry a baby that much longer after the due date, ack. Here's hoping baby comes soon! And I love Valentines too solely because every year we get take out and chocolate candy lol! Food is the best part of Valentine’s Day. I hope the baby comes soon. We’re getting impatient. Good on you for giving up on books! For far too long I didn't do that, and so it was only in the last few years that I felt that I need to start throwing my hands up in the air and saying: enough is enough! I used to force myself to read books, but I don’t anymore. Every year I get better at DNFing. Oh man, hopefully the baby gets here soon! Best books in the last 5 years? I couldn't even begin to think about that, that's insane! Good luck! That post was so hard to write! It took me days to choose favorites and format the post. It’s a big one. I didn't like Shadow of the Wind either, which was sad because it sounded so much like it was going to be my kind of thing. About a kid reading a sort of magical book with mysterious libraries. Argh! Why wasn't it more fun! I felt the same way. It sounded like a book I’d love, but it kept draaaaaging. I wanted something to happen. The Shadow of the Wind is one I ended up DNFing too. I had heard so many great things about it, but it was so slow that I just lost patience with it. Yay for Valentine's candy. That's the only part of the holiday I really get into, lol. The same thing happened to me. It was too slow, and I didn’t care about the characters, so there was nothing to keep me reading. I hope you get to cuddle that new baby very soon! I am sorry to hear that you had a couple of dnfs. 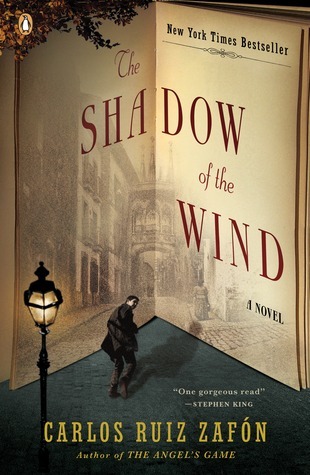 The Shadow of the Wind has such a great cover so it is disappointing to know that it was so slow. I really need to have my dogs groomed. They are all just a mess! Both of those books have great covers, which is really disappointing! I’m hoping the baby gets here soon, too. Yeah...I'm getting to the point where I will DNF a book if I truly can't continue reading it. I have The Shadow of the Wind on my bookshelf but have not read it yet. I hope you like it more than I did! 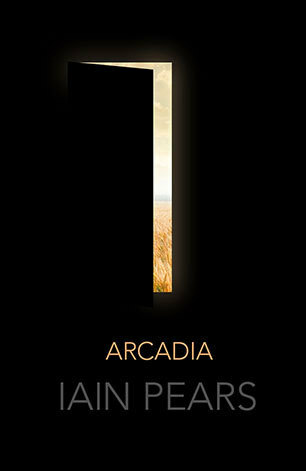 Ouch, Arcadia and Shadow of the Wind certainly sound and look appealing, but gah. Slow pacing ruins things for me entirely. I don’t mind slow books if I love the characters, but I didn’t feel anything for these characters, so I got bored. That’s what I keep telling myself. The baby can’t stay in my sister forever :). You did the right thing. I hope your next book pulls you in!